2018 Toyota Camry 2018 XSE – True Performance Sedan? For 1970, Chevrolet jumped into the growing personal luxury 2-door car market with the release of the Monte Carlo. This was at the pinnacle of the muscle car era, so it’s no surprise that Chevrolet offered a performance oriented version of this new car called the Monte Carlo SS. The 1970-1971 Monte Carlo SS soon became a niche performance car – produced in much smaller numbers than other "SS" badged Chevrolet cars of this period. For 1972 the SS performance option on the Monte Carlo lineup was dropped – the muscle car era had ended. The Monte Carlo however increased in popularity during the 1970s which was the era of the personal luxury 2-door. The Monte Carlo may of had different V8 engine options to choose from after the cancellation of the original SS, however none were performance oriented. The 1970-1971 Monte Carlo SS provided plenty of punch with a LS5 454 CID V8 (rated at 360 horsepower for 1970 and 365 horsepower for 1971) – dual exhausts were standard on the SS. Performance did return to the Monte Carlo for 1980 and 1981 in the form of Buick’s turbo 3.8 liter V6. The turbo Monte Carlo was by a long shot much faster than all the V8 equipped 1980-1981 Monte Carlos. Though sales were good initially for the turbo Monte Carlo, by 1981 sales slumped and the turbo V6 option didn’t return for 1982. It seemed that the idea of a performance Monte Carlo was a thing of the past. However just like the old saying "three times is a charm", Chevrolet’s third attempt at a performance Monte Carlo was a mega sales success. 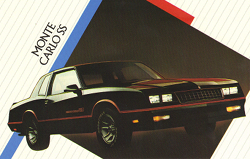 Chevrolet revived the Monte Carlo SS at the middle of the 1983 model year. Sales continued to climb for the SS through the 1986 model year – reaching a total of 41,364 units for 1986 alone which was more than the total production of the 1986 Chevrolet Corvette (35,109 units). Sales remained strong until the beginning of the 1988 model year when GM pulled the plug on the rear-wheel drive G-body platform which the Monte Carlo SS used – thereby ending production of the rear-wheel drive Monte Carlo. 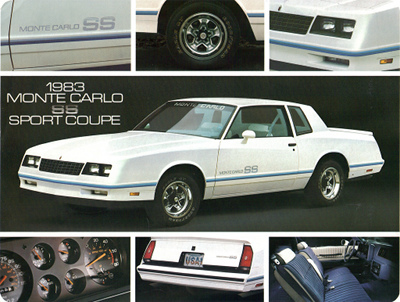 The 1983-1988 Monte Carlo SS had (by 1980s standards) attractive modern sporty styling, a large and comfortable interior that fit five adults, and a large trunk along with all the performance goodies that you would expect from a traditional muscle car. Performance was delivered by a 175-180 horsepower L69 5.0 liter (305 CID) H.O. V8 which produced around 20% more output than the average V8 of this era. The 1983-1984 Monte Carlo SS had a mandatory 3-speed automatic with 3.42 rear gears and the 1985-1988 Monte Carlo SS had a mandatory 4-speed automatic with 3.73 gears. Unfortunately a manual transmission was never available as an option on the 1983-1988 SS. A number of auto journalists who tested the 1983-1988 Monte Carlo SS commented that their best SS performance times were obtained from power braking at initial launch and then manually shifting the automatic transmission (one writer even commented that 5,000 rpm was the optimum manual upshift point). And many of the magazine tests back in the day showcased pictures of a SS doing a burnout. Anyone who has had a pleasure of driving one can attest to how easy it was to do a burnout in these cars even when equipped with the optional limited slip rear axle. The consensus of most magazine writers back in the day was the 1983-1988 Monte Carlo SS was one very fun modern rear-wheel drive V8 powered muscle car. As you can see with the long list of performance figures listed in the table below, the 1983-1984 Monte Carlo SS easily matched the performance of the heavier 1970 Monte Carlo SS 454. The secret of the 1983-1988 Monte Carlo SS’s success was it gave performance buyers exactly what they were looking for and a total of 160,462 were sold during the 1980s – a massive number considering Chevrolet originally anticipated the SS being a limited production car. Had GM not so stupidly eliminated the popular rear-wheel drive G-body platform in 1988, the rear-wheel drive Monte Carlo SS would probably still be around today doing battle with the late-model Ford Mustang GT, Dodge Challenger R/T, and Chevrolet Camaro SS. GM tried to renew the spirit in recent years with a front-wheel drive 2-door Monte Carlo SS – even with powerful V6 and V8 motors under the hood the newer SS never really captured the success of the 1983-1988 Monte Carlo SS or the soul of the 1970-1971 Monte Carlo SS.